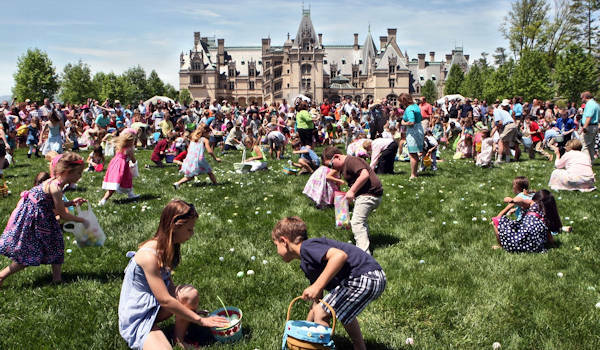 The biggest Easter egg hunt is in front of America's biggest house 9:30 AM until 2:30 PM. There are two hunts, 11 AM and 1 PM on Easter Sunday, for ages 2-9 years old. Registration begins two hours before hunts. Arrive two hours early for activities. Exchange eggs for a treat bag. There's no extra fee to participate - including in Biltmore admission. 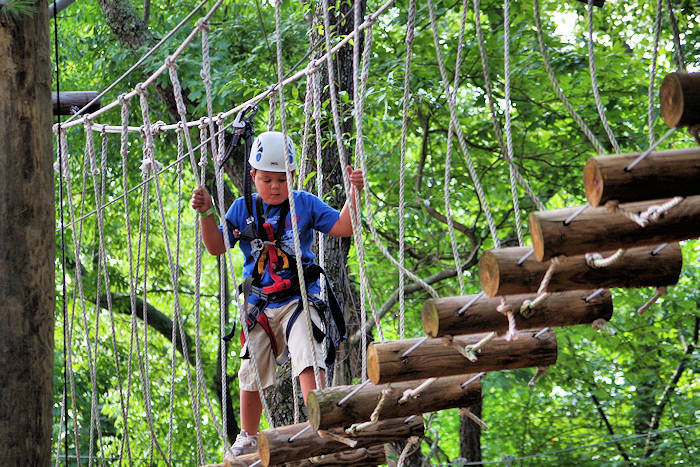 More activities for kids including sheep herding and grape stomp at Antler Hill Village. 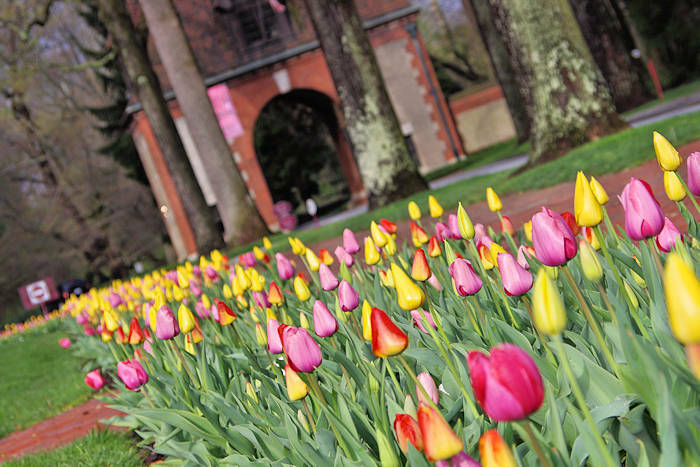 See our Biltmore Guide to plan a visit and see all the spring blooms. Easter on the Green on Saturday 2-5 PM in Pack Square Park is a free festival with age-specific hunts throughout the afternoon, ages 12 and under. Meet the Easter bunny and play oversized games. Our mountain scenery provides the perfect backdrop for a spectacular sunrise service. 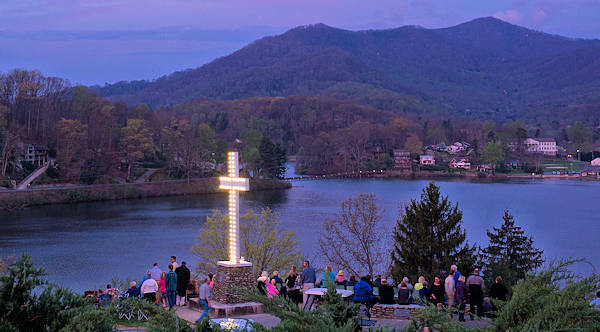 Go to Lake Junaluska for their 7 AM service by the big cross, followed by a breakfast buffet at The Terrace hotel. Or go to Chimney Rock Park to watch the sun rise over Lake Lure during a 6:30 AM service (read more) - with breakfast buffet at the Old Rock Cafe after. Since Good Friday is a city holiday, enjoy free on street parking - so don't feed the meters. All stores and restaurants will be open Friday and Saturday. Sunday is always free, but many stores will be closed. 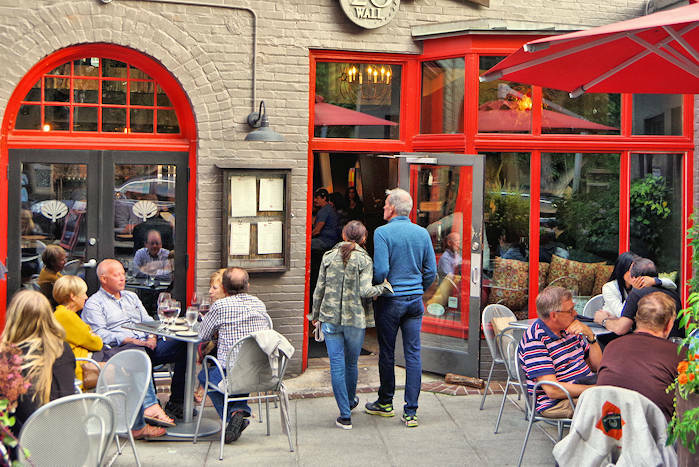 See our favorite things to do downtown. The higher sections of the Parkway may remain closed due to remaining ice and snow. Read about current closures. A great alternate scenic drive is the Forest Heritage Scenic Byway. Peanuts Easter Beagle Express on the Great Smoky Mountains Railroad - Join Snoopy, Lucy, Charlie Brown and the Easter Bunnies for plenty of fun on a 4-hour trip, with a 1.5-hour layover in Dillsboro for activities. Departs Bryon City. From $29/child, $51/adult. Deerpark Restaurant on Biltmore.Estate- Elaborate buffet with stations for omelets and waffles, hand-carved entrees, southern sides, salads, soups, desserts. 10 AM-3 PM. Reservations & Biltmore admission ticket required. Blue Ridge Dining Room at Omni Grove Park Inn - Farm-to-table artisanal buffet with views of Blue Ridge Mountains. Two big rooms filled with stations with many options. 12-5 PM. Season's at Highland Lake Inn (Hendersonville) - Starters, salads, sides, brunch favorites, carving station, pasta station and desserts. Legend's at Tryon International Equestrian Center (Tryon) - Brunch buffet with carving station and omelet station, 10 AM-2 PM, Kids egg hunt & carousel rides at 2 PM. See more top places for Weekend brunch. 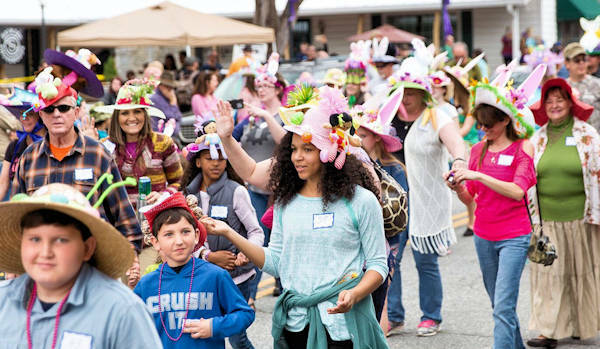 The most unique and quirky event is the Easter Hat Parade in the artsy village of Dillsboro. Hundreds of people parade down the street with judging in 20 categories. The parade includes antique cars and the Easter bunny. The parade is 2 PM on Saturday, but come early for hat-making sessions and egg hunt. Read more.